In recent months, many individuals have sought out information on active pest control for cluster flies. While the cluster fly is native to Europe, they have been pushing their way to the west for several decades. Since mid-February of 2015, cluster flies have been invading Alaska. Prior to this time, no reports of the flies had been made in Alaska; however, these flies have been noted in British Columbia and they are among the few different insects that are known to overwinter when in cold climates. Cluster flies are similar in appearance to standard houseflies; however, they have more of a “woolly” appearance as the hairs on these insects are longer and thicker. Furthermore, cluster flies are much larger than the ordinary house fly. The reason that they are referred to as “cluster” flies is that they have a natural tendency to cluster or gather together on walls, windows, and other areas. Before learning active pest control on cluster flies, it is first important to understand some general information regarding these insects. First, these insects are often referred to as “attic flies”. The adult flies measure anywhere from 8 up to 10 millimeters, as far as their length is concerned. The abdominal region is typically either light grey or dark gray in color and has a checkered pattern. The thorax region is often covered in golden hairs. The wings, when at rest, overlap one another. As mentioned previously, these are typically larger than a standard house fly. 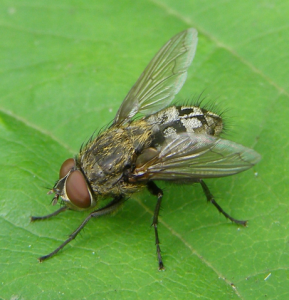 Furthermore, the coloring of a cluster fly is darker and these flies move a bit more sluggishly than regular flies. Infestations of cluster flies are commonly found on sides of structures that have a large exposure to sunlight. The heaviest concentrations of the pest are most common around the late fall months and early winter months. During periods of cold, they seek out warm places to live. These insects may enter into a small opening present in a structure. As a result of this, they may enter into secluded regions of a home, such as the wall voids and the attic, for the purpose and intent of hibernating. On warmer days, they will move from these secluded areas towards a light source. This is when many individuals notice the insects within their home. While these flies do not sting humans or result in illnesses, they are considered to be a nuisance because of the vast number of flies that are typically found within a cluster. First, you should practice the art of exclusion. That is, to completely close and thoroughly seal as many different openings as possible in and around the home so that the flies may not enter into the structure. This may prove to be very time consuming. While this is highly effective, exclusion does not guarantee 100% success. The next active pest control strategy is to utilize a compressed air spraying device to apply a chemical-based surface sprays to various regions of the home. Examples include the windows and beneath eaves. Finally, if you have cracks and crevices around your home, you should use a pyrethrin-based aerosol spray to treat these regions.